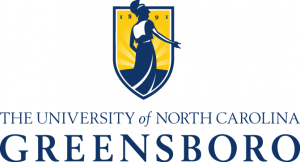 The University of North Carolina-Greensboro was experiencing two distinct enrollment challenges: student retention and incoming freshman rates. Due to a sharp decline in just four years, the enrollment number had dropped about 1,000 students. Under the leadership of Dr. Bryan Terry, Vice Chancellor for Enrollment Management, UNCG has been doing a great deal to remedy these enrollment setbacks by utilizing Veera Predict and Rapid Insight Veera Construct data blending and preparation tool. These new strategies have helped them to bring retention up 4.5 points within two years, but they are always looking for new ways to manage enrollment and retention. By implementing a robust reporting and predictive analytics system, Jeffrey Collis, Data Manager at UNCG, innovatively developed a system that permits instantaneous access to important decision making data. Within Veera Construct, Collis has built 9 jobs that are constantly updating a series of dashboards within Tableau. These visualization platforms focus on ensuring that deans, enrollment management, provosts, and vice chancellors have timely access to enrollment data. This day-over-day information allows for the faculty of the institution to make important decisions regarding its students, faculty, and classes. The dashboards allow the user to see daily enrollment information in comparison to that same day the previous year. For example, the Vice Chancellor, can look at the eighth day of the 2016 Fall semester in comparison to the eighth day of the 2015 Fall semester. This way the faculty can begin to make certain decisions based on previous data. Enrollment information such as applied, admitted, confirmed and registered students can be observed. Collis has also set the data up in a way that allows for them to see which students have registered for classes, who has not applied for financial aid, but did last year, and who has filed for a transcript. Certain red-flags such as these, indicate whether staff need to send out reminder emails, or preform targeted outreach of some sort. If a student has filed for a transcript, Collis has found that this can be a big indicator that this student is not likely to retain. This is substantial information that key decision makers can act on. On top of this enrollment information, the dashboards also display knowledge about student class registration and which courses a student is taking. This particular information can aid in making decisions that relate to faculty allocation and class management. If there are 100 fewer students registered for Biology 112 for Fall 2016 than there were last fall, a decision can be made to cancel a section to give room for other options. A filter can be added that shows which first time undergraduate students had taken college credit courses prior to enrolling at UNCG. This can also be useful for deciding which courses to offer and which sections to cut down on. Additionally, departments can see which students have signed up for DFW courses. DFW courses are courses where there is a large percentage of D’s, F’s or Withdraws. Knowledge of who is attending them and who is at high risk of failing out, can be really helpful to retaining a student and to that student’s overall experience at UNCG. Meet Jeffrey Collis, Data Superhero at UNC-Greensboro. 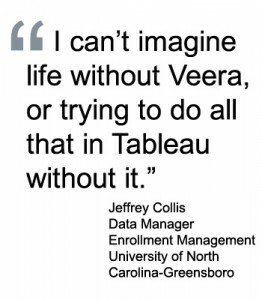 He uses Veera Construct to prepare data for reports and Tableau Visualizations that are utilized by key decisions makers at UNCG. So what makes Veera Construct essential to this process? It is often said that in reporting and analytics, 80% of the work is data preparation. Veera Construct does all of this heavy lifting for UNCG, while Tableau then produces the attractive visualizations. To get all of the information needed for the various stakeholders, a lot of data has to be gathered and blended from multiple databases and systems. The resulting datasets also include calculated fields that pull in data from snapshots in time for all of the dashboards. It can be a tedious and time-consuming process that could take 1000s of lines of code or the most complex excel sheets to get one report remotely close to the capabilities of Collis’s Tableau dashboards. Collis has utilized the power of Veera Construct’s drag and drop interface and developed a series of sophisticated subroutines that can be reused within his various data preparation jobs. By using the subroutine approach, edits can be made in a single place, while these updates are automatically made to that subroutine wherever else it is referenced, saving him a lot of maintenance time and ensuring accuracy. 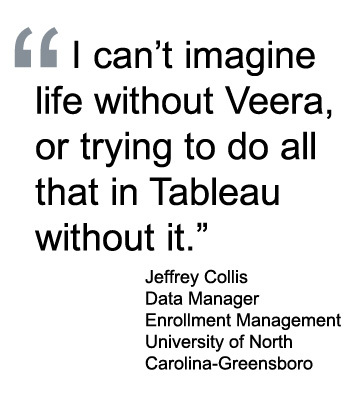 For Collis, Veera Construct is accessing UNCG’s Banner data as well as other essential enrollment and student information. It allows the user to create validation tables, lookups, and newly calculated fields, allowing sophisticated filtering in Tableau dashboards. Due to these functions, the front end users get a much more souped-up dashboard that can provide insight into certain student behaviors. Six of these jobs are automated and update every morning, allowing for faculty to immediately see reports regularly. Collis has even built dashboards upon request of faculty, that he would not be able to do as easily without all the data being as accessible as it is with Veera Construct. Aside from the bulk of the work, Veera Construct also has some components that allow for a fully automated output process to Tableau. The TDE node existing within Veera Construct automatically transfers the data to a Tableau Data Extract file format, which is essential to Tableau’s ability to receive information for instant updates. In addition, for users of Tableau online, there is an option within Veera Construct to directly update that as well. By simply adding one of these nodes to any job within Veera Construct, Tableau dashboards can be automatically updated without any need to refresh the visualizations within Tableau. By going directly to a TDE, it is faster and bypasses the need for an interim step of going to an Excel or CSV file.